Got two mounted on the back wall of the box...a tight fit required a little trimming and will need some touch-up painting once they are caulked and permanently installed. I hope to get the third one done in between thunderstorms that are rolling through PA today. Got my new white tarp from Ebay put up now...better than the blue ones, but was even shorter than "nominal" size that I expected. It will provide enough shade to prevent overheating when I need it. I have to find elastic cords to hold it in place...some thing better than the produce rubber bands I am using now ;-) No more Road Runner background. Looks great Bruce, starting to look like a collector. Those short ducts are a real plus. Are you planning to insulate them? The 'adjustable' duct elbows I have purchased at Home Depot are a bear to actually adjust. I had to lubricate the seams with Silicone spray and really yank on them to get them to move. I think the ones from Grainger and other 'pro' sources are a little better. Curious about your intake duct where it enters the collector. Did you capture the screen with the duct take-off tabs? I think you said something about that earlier. Is there a hole in the screen for the duct? It's hard to tell from the picture now that it's all flat black. Are you going to do the output duct the same way? Curious too about your 'channel dividers'. Are they going to attach to the screen frames? Seems like a good way to do it. I was going to try that on my 4x8 until I kept changing my mind about the screens and ended up attaching the divider to the back panel. I still think the first option is a good idea; interested to see how it turns out. Screens look real good too. I bet that oak doesn't warp at all. The HD adjustable elbows were OK for me to swivel and seem to be fairly tight and I will seal them up. Once I do the other duct going back into the house, I have mastic and tape to seal the joints and insulated flex duct that will cover all the outside ducts. 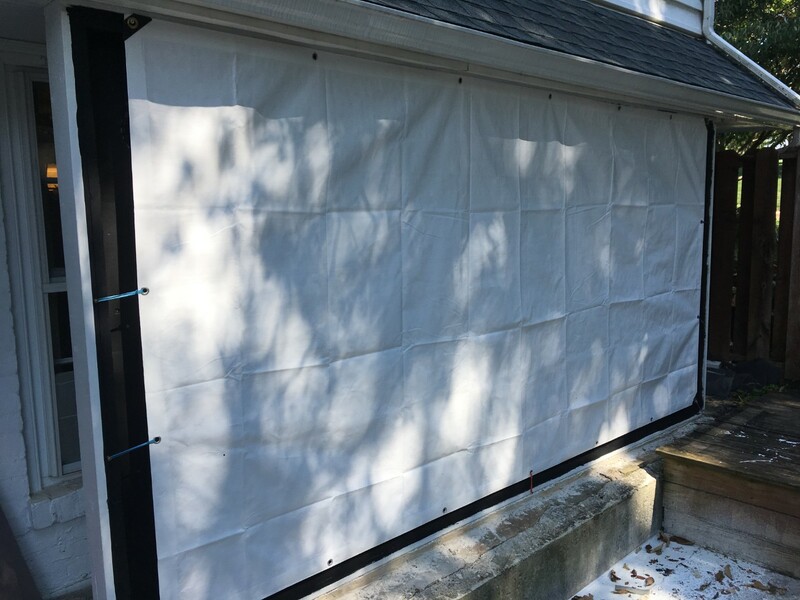 I thought I may enclose the entire backside of the collector to the house walls, but that would block the light from the windows and probably lead to moisture problems. 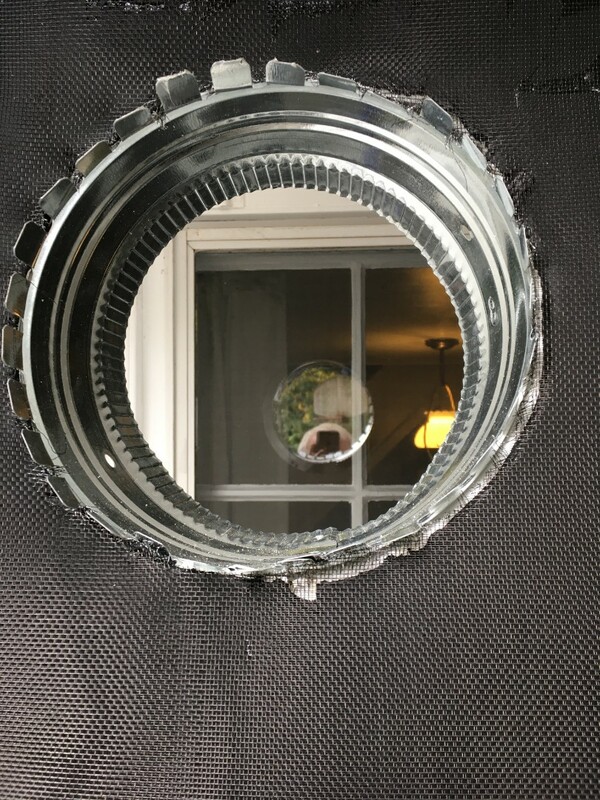 When I do the permanent installation of everything I will trim the screen and make a collar of some sort to capture the screen down into both the ducts. I hope to figure something out that will allow maximum airflow for my little fan. The front screens will just cover the entire plentium area...we will have to see what the final design will be there. The channel dividers are 10 foot long 2x2's that will run right on top of the cross bars of the screen frames and be siliconed into both the top and bottom sets of screens. 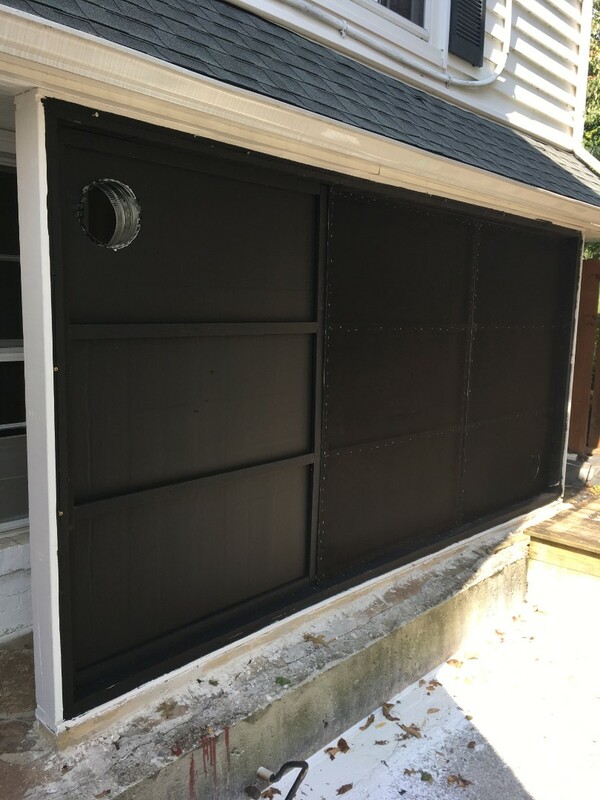 I will secure them to the back screens insulation and plywood back with 3 1/2 inch deck screws. The center four intersections of the screen frames will be bolted through to the back and out through the front via the extruded aluminum H supports for the glazing and steel conduits across horizontally across the front. I am waiting to assemble the glazing supports before I know exactly where the holes for the four "through sandwich" bolts will be located. Either that or I will just screw the layers together as I go. I don't think there is any lack of strength in any of my structure. 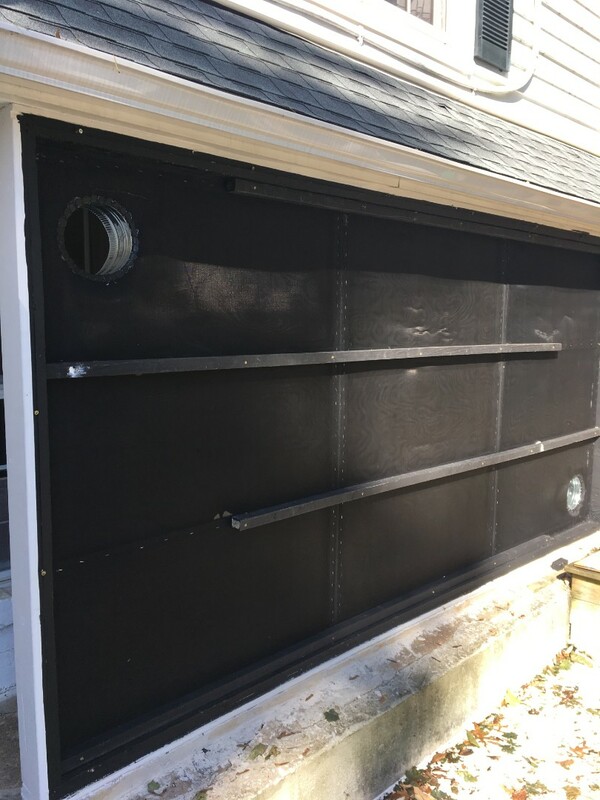 The twin wall glazing will be sealed with EPDM left over from the tank I built for my water heating system a couple years ago. Sounds like a plan - you've thought of everything. One idea for the duct ports, if you want to keep the back screens in a flat plane, would be to make a ring, the same thickness as the back screen frame, and fasten it somehow to the back wall. I guess if the ring was made out of wood you could glue + staple the screen to it. Maybe even add a sheet-metal face ring over the screen to help keep the screen from unraveling. I haven't tried it, and you may already have a better idea; it's just another detail I have also been thinking about. Having the back screens go all the way to the edge should make it easier to support the front screens, and collect more heat too. 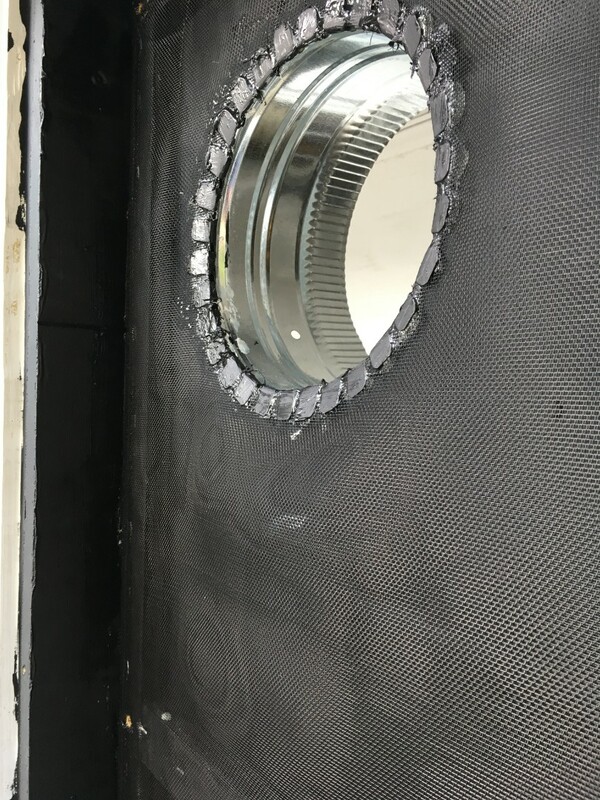 I worked with making a circular cut out of stainless steel that I had saved from something that is just big enough to make a 1 inch wide ring around the 8 inch holes for the ducts and can stretch the screen under it, fasten the ring, and cut out the opening. I have been busy at work with fall sports every weekday for the past two weeks and I am on vacation now (sitting in a beachfront condo in Stone Harbor watching it rain outside right now) so I won't get back to my project until next month. Well, I am back from my vacation and a one and a half day stay in the hospital and recovery and now back to work on the heater. I've been driving to fall sports every weekday and have finally gotten back to my project this weekend. I caulked and screwed in the back screens and cut in the ducts, caulking in the tabs and touching up the paint where needed. I also caulked and screwed on the dividers and am now ready to do the front screens. I decided to skip the rings over the duct openings as I seemed to get a smoother and flatter result by just tucking the screens into the tabs with lots of silicone caulk. I may add a few screws to better secure the ductwork. I had limited sun today but still found the back screen to be warm to the touch while trying to work on it. Had to wait until the sun went past to do the painting ;-) This might work! So - you were able to secure the screen against the back wall by bending the tabs down and sealing with silicone? Makes for a clean, simple installation. Did the screen tension try to push the collar up while the silicone was still wet, or did you have to hold it down somehow mechanically? Looks good in any case. I'm wondering how you're planning to mount a temp sensor or thermal switch (snap disc) inside the collector. Is that going between the screen layers? Seems like it would have to if the front screen goes all the way to the edge of the enclosure. I remember on my very first collector, I had just finished attaching the glazing, with silicone + screws, when I realized I had forgotten about the snap disc. I had to reach in through the duct hole and fasten an angle bracket to the side wall (mostly working blind). Feel kind of stupid even admitting that. Fortunately I haven't repeated that blunder. I have found a couple of temperature controllers that should be used instead of snap switches. They have infinite temp level control to tweak where a snap switch is locked into a single temperature. First, decide if you want a 12 VDC system or a 110 VAC system. The 12 VDC system would be good if you need a backup system in case of power failure. It could be powered by 12V batteries and a trickle charger in a pinch. 12 V fans would also be needed. These controllers have 12' probe leads where most others have 3' and there's cool video on how to use them. I find it's good to be able to adjust temperature levels when you need to fine tune things.